Arguably the biggest challenge this century will be to better understand the Earth’s climate and how man effects it – so called Anthropogenic Global Warming (AGW). The basic science of climate is actually pretty straightforward, however the devil is in the details. All the fierce arguments about AGW are concentrated around just one thing – climate feedbacks. The urgent calls for immediate action to “tackle” climate change are based on the assumption that feedbacks will amplify by a factor of ~3 an otherwise moderate temperature rise resulting from a doubling of CO2 levels. We also know that large natural variations in climate have occurred in the past and will continue to occur in the future, in particular regular ice ages for the last 3 million years. A new glaciation cycle would be catastrophic for mankind. What causes them and could AGW actually delay or even offset the next ice age ? The sun lies lies 1.4958×108 km from Earth and radiates energy to Earth. The sun’s surface temperature is 5,770K [(ref. Kopp & Lean 2011)] and its radius R is 6.955×10^5 km. Therefore the total radiation emitted by the sun (applying Stefan Boltzman’s law) is is 4*PI*R^2*sigmaT^4, which works out at 3.8205*10^26 watts. The amount of radiation reaching the Earth at is 4*PI*RE^2(sphere at average Earth’s orbit radius RE) * rad^2/4 (ratio of circular cross-section of Earth to it’s surface area). Although the Earth has an eliptical orbit, it works out that the average annual radiation is almost exactly that of a circular orbit. The solar constant S0 is the incident solar radiation per m2 just outside the earth’s atmosphere and is also measured by satellite. This can be calculated using (R^2*sigmaT^4)/(RE^2) which works out at 1361 watts/m2. When averaged over the Earth’s surface (4piRE^2)/(piRE^2) works out at 340 joules/m2/s-1. The average global temperature of the Earth’s surface is then determined by the effective black body temperature of the Earth observed from space. There are two main effects which need to be understood to estimate the energy balance. The Albedo is the fraction of radiation which is reflected back into space by the Earth (from ice, clouds, land surfaces etc.) This is roughly 0.3 so that approximately just 239 watts/m2 is absorbed by the Earth’s surface which warms up and then radiates infrared heat according to Stefan Boltzman’s law. Greenhouse gases absorb infrared photons from the surface , gain some kinetic energy and re-radiate photons in random directions. Some photons return to the surface, others re-interact diffusing energy up through the troposphere until it escapes to space. The main greenhouse gasses are water vapor H2O and Carbon Dioxide CO2. Globally somewhere between 70 and 90% of the greenhouse effect is due to water vapor, but it varies rapidly on an hourly basis. 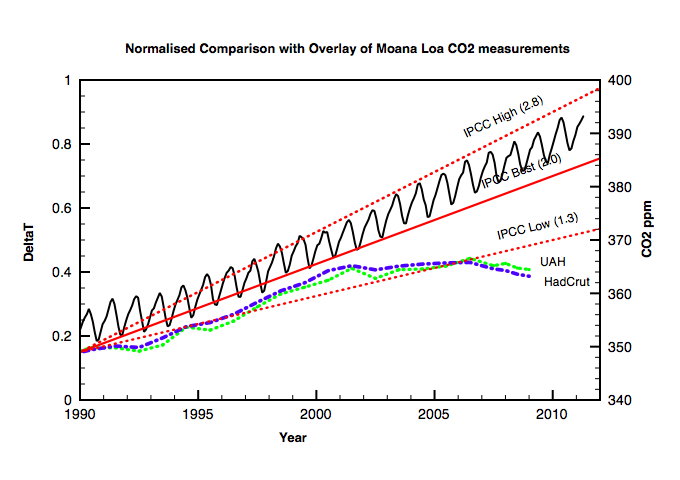 CO2 on the other hand has a long lifetime and varies only gradually. For example, In the desert there is little water vapor and temperatures can fall to freezing overnight as infrared heat escapes to space. 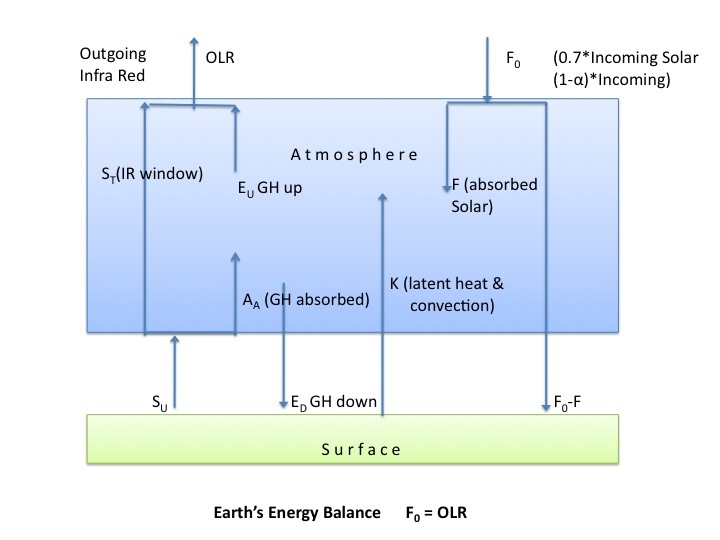 The atmosphere is opaque to CO2 in the sense that the mean free path for infrared photons in the absorption bands is of the order of meters at the Earth’s surface . The density of CO2 falls off rapidly with height as does the temperature (adiabatic lapse rate). At a certain critical height photons in CO2 absorption bands escape to space, but their energy is much less than it would have been if there was no atmosphere. The net result is an effective warming of the surface by downward IR as the Earth balances its energy. To calculate this properly needs radiative transfer codes which model the transfer of energy through the atmosphere. An example is Modtran . The net effect of these calculations can be summarised in a single formula. where DS is the extra radiative forcing (watts/m2) due to an increase in CO2 concentration from a reference value C0 to C. If we take C0=280 ppm(pre-industrial revolution) and C=390 ppm (now) then we predict an extra forcing due to man of 1.76 watts/m2. Similarly if we double CO2 concentrations by the end of the century the direct radiative forcing will be 3.67 watts/m2. How does the temperature of the Earth change in response? The answer is easy because the earth warms a little until it’s extra black body radiation balances again. Stefan Boltzmans quickly balances energy – it is the ultimate negative feedback. 1) For 1750->today DT = 0.33 degreesC 2) A Doubling CO2 = 0.68 degreesK Note that these increases are rather moderate, especially compared to the 4-5K increase seen since the last Ice Age. One can also derive a formula for temperature increase versus CO2 concentration which works out to be DT=1.6Ln(C/C0). 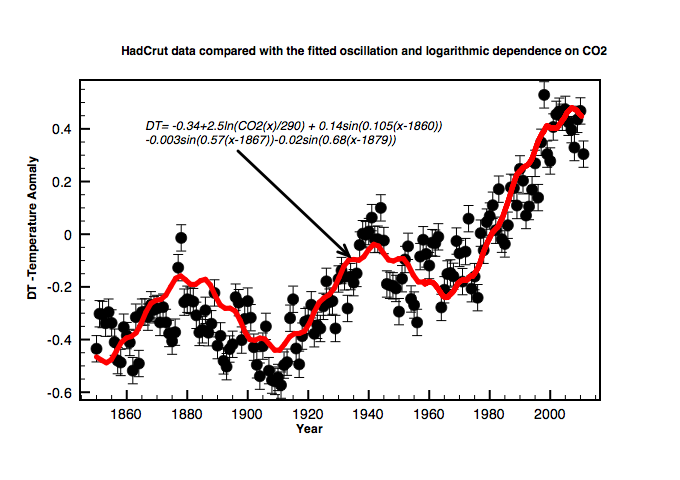 If you accept that all the observed warming from 1850 to date is due just to CO2 increases alone then a better fit is found using a modified formula of DT = 2.5 Ln(C/C0). After you do this fit another phenomenum becomes clearly apparent over and above any greenhouse effect of CO2. The Earth seems to have regular natural climate oscillations with a 60 year cycle. We are now in the downward temperature cycle of this natural effect which may explain why we have seen no warming for the last 11 years. In fact it seems likely in this picture that no further warming will occur before 2020 when renewed rapid warming should reoccur. 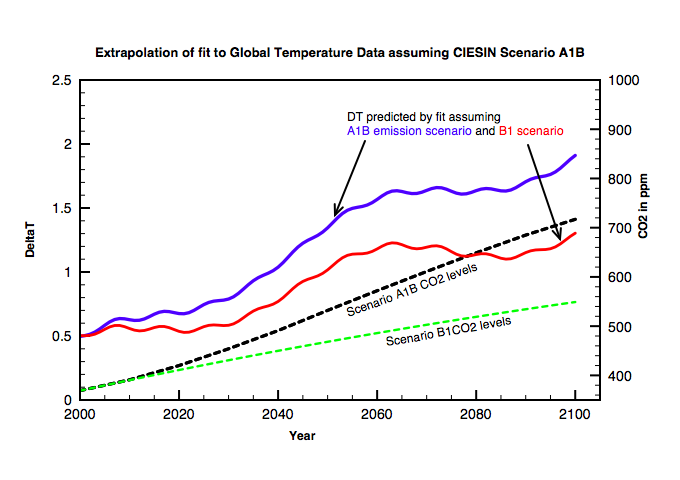 The following curves are based on the IPCC emission scenarios for the next century, and use the fitted temperature dependence on CO2 above to extrapolate forward. This issue is the crux of the argument between “sceptics” and “realists” which spills over into name calling. So for example sceptics call realists – climate “alarmists” and realists call sceptics climate “deniers”. The basic argument of climate sensitivity is the following. A small rise in global temperatures should lead to more evaporation of water vapor and to slightly more ice melting. Does more water vapor enhance warming further through extra greenhouse effect, or do clouds increase ? A net melting of ice will lower albedo in far northern and southern latitudes although far larger melting occurs every summer. Other feedbacks include a reduction in the lapse rate from the dry adiabatic which acts against the greenhouse effect. Climate feedbacks are defined as shown below. A change in forcing DS from increasing CO2 is enhanced above Stefan Boltzman loss by extra feedback terms F leading to a larger (or smaller) temperature change DT. Whether or not AGW is “dangerous” or not will depend on the magnitude and sign of F. If it is as large as IPCC reports assume then temperature rises of 2-5 degrees C are predicted for a doubling of CO2 levels and this drives the whole climate change and carbon politics. However, if F is zero or even negative then a modest temperature rise of about 1 degree is expected which may even be beneficial. 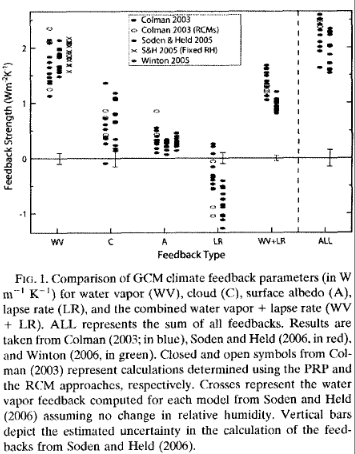 The average feedback assumed by IPCC models then works out at around 2 watts/m2 per degreeC rise in temperature. This reinforces the direct radiative forcing from increasing CO2 yielding rises of between 2 to 5 degreesC depending on the model. In fact these predictions were made in the original IPCC report from 1990 and can actually be compared to the data since then. The more extreme predicted temperature rises made in 1990 are not supported by the data. The flat temperature profile for the last 10 years, as mentioned above could also be due to a natural 60 year oscillation. The Earth is currently in a long lasting Ice Age interspersed with shorter interglacial warm periods. We are currently 10,000 years into the most recent warm period which likely will end within another 5000 years time. Why the Earth began cooling about 3 million years ago to enter a series of ice ages remins a mystery. 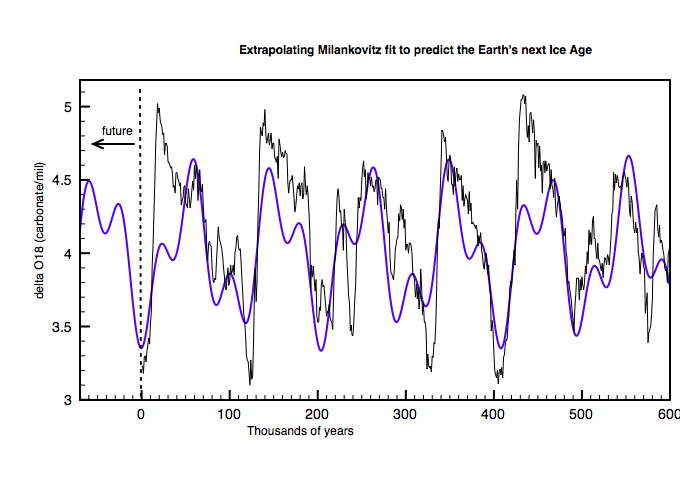 The driver for the ice ages are orbital variations of the Earth called Milankowitz cycles but the details are uncertain. The change in tilt angle of the earth’s rotation changes the strength of summer and winter for each hemisphere extending the arctic regions, and a clear signal for this is apparent in the data. However for the last 900,0000 years the cycle seems to be driven by changes in ellipticity (eccentricity) of the Earth’s orbit. These changes are not sufficient to explain the large temperature swings. Climate scientists who follow CO2 as being the main driver point to this as evidence of large climate sensitivity as CO2 concentrations change during an ice age from a cold 190ppm for high glaciation to about 280 ppm in an interglacial. However, it is not clear what is cause and what is effect. All this is discussed here. Longer term geological evidence and the faint sun paradox essentially can rule out high climate sensitivity over the long term. We know that liquid oceans have been present on Earth as early as 4 billion years ago, when the sun was 30% less bright. This means temperatures cannot have been vastly different than today. As the sun strengthened feedbacks as high as 2 watts/m2/degC would have caused run away temperatures, and boiled the oceans. It seems likely that there are stabilising effects on climate which lead a water covered planet like Earth to self-regulate temperatures – further information here. The next 20 years should pin down climate science and determine whether the doom mongers are correct. Curbing carbon emissions is going to be almost impossible while the world’s population continues to grow. My personal view is that humans have massively changed the global natural order and CO2 emissions are a symptom of this rather than the overriding central issue. Only if and when population can be stabilised will we have a hope of balancing human needs with those of nature. Concentrating on CO2 emissions is probably a diversion from this primary problem. I think that the evidence supports the “sceptical” view that temperatures will not rise by more than about 1 degree between 2000 and 2100. Despite this, the push to find new energy sources has a beneficial side effect of climate change policy, and is probably necessary. However, renewable energies currently have far too low energy density – wind energy for example in the UK comes out at just 2 watts/m2. Is it really worth covering the most beautiful parts of britain with 100 meter high unreliable turbines, while China continues to burn cheap coal ? Solar energy farms in deserts, short term expansion of nuclear power until nuclear fusion is tamed are a better investment for us and for the natural world. Part 2: The real cause of Ice Ages ? – Resonant dust clouds ? Does the Moon effect the Earth’s climate ? Footnote: The latest accurate measurements of the solar constant are from SORCE TIM and give a value of 1360.8 watts/m2. This is lower than the previous value of 1367 watts/m2 still quoted on Wikipedia and used by most climate models. This is important also for energy balance calculations since the incident average solar radiation on Earth is 340 watts/m2 and not 342 watts/m2. I doubt it. Climate change has about as much impact on our lives as continental drift. Nobody you know is going to be inconvenienced, let alone killed, by the imperceptible drifting of the 17-year running average of weather. The bizarreness of our obsession with climate will take a few years to be widely acknowledged, but when it is, expect to see climate research return to its former status as a niche science of no particular urgency. The biggest challenge is to understand and arrest processes such as cancer and dementia, which will destroy the lives of most of the people you know. Clive, feel free to moderate this out of existence as I’m not sure I want it recorded for posterity. The essence of the AGW argument is that Earth has an ideal average temperature of say 15C. Lukewarmers like me claim that it makes no difference if this temperature climbs to 16, 17, or even 18C. Obviously I’m wrong, but so are the warmists. Earth may very well have an optimum average temperature, a Goldilocks temperature. But some regions are going to be too hot and others are going to be too cold. The regions that are just right: are they in the majority, or are they a small minority in between two extremes? To try and put a number on it I went to http://en.wikipedia.org/wiki/List_of_countries_by_population and downloaded the data into Excel. Then I fired up Google Earth and established the northernmost and southernmost latitudes of each country, capturing this on my Excel worksheet. Next I created 18 zones each 10 degrees of latitude wide, and allocated the world population between those 18 zones. Where a country spanned multiple bands, I split the population of that country equally between the zones. Although my method leaves PLENTY of room for improvement, errors will probably balance out. As the Aussies say, near enough is fair enough and fair enough is good enough. From the sharp drop-off in population, I might guess that once you cross latitude 40 going towards the poles, the environment is less suitable for habitation. I might then guess that the reason for this is low temperatures. But those are only guesses and on a site like this, visited mainly by the extremely bright, knowledgeable and experienced, I’m not going to make myself look any more stupid than absolutely unavoidable. But a more refined version of this information could be used to answer a simple question: who are the winners and who will lose from global warming? I might not be as bright as you guys but I’m smart enough to see that this is the central problem in the climate debate. I think your analysis is about right. There are less people living in cold dry polar regions because there is less food available and more effort is needed to keep warm. The tropics are warm and damp and food is plentiful. The climate in the tropics is dominated by the oceans which maintain comfortable temperatures around 30C. It is only in the centre of continents like Australia and Africa that very hot dry deserts form. Very few people live there. One interesting fact that is not well known is that Southern Hemisphere summers receives about 10% more solar radiation than the northern hemisphere because it coincides with the shortest distance between the sun and the earth. This is a much larger effect than any conceivable AGW effect. I am also a luke warmer. Doubling CO2 alone is calculated to raise temperatures by about 1C globally – no big deal. It is only by the far less clear argument that the net effect of water results in a positive feedback, that the IPCC scientists derive much higher predictions. It is beginning to look like these high feedback values from H2O are not true. The whole CAGW science/politics/industry is like an inverted pyramid fed with vast governmental/inter-governmental funding. Right at the bottom of the pyramid is CO2 radiative transfer theory and immediately above that is positive H2O feedback. If positive H2O feedback fails then the whole lot collapses. Thanks Clive for your very informative reply. I’ve enhanced my population spreadsheet with an arithmetically better split between latitudes, as well as land areas derived from Iain Inglis’s excellent spreadsheet at climateprediction.net. Now I have population densities by latitude which I intend to post here shortly. You have identified a 60-year climate cycle and I wonder if water vapor is not the underlying mechanism? This is of course pure speculation. Unfortunately I won’t be alive in 2020, when you expect warming to resume, and as I don’t believe in an afterlife I can’t even console myself with the prospect of watching to see who’s right from heaven or hell or wherever! Hopefully we won’t have to wait that long before a “small boy” somewhere notices that the emperor is walking around with no clothes on ! You might enjoy Tom Fuller’s blog thelukewarmersway.wordpress.com/ and get some traffic for your excellent page too. “One interesting fact that is not well known is that Southern Hemisphere summers receives about 10% more solar radiation than the northern hemisphere because it coincides with the shortest distance between the sun and the earth. This is a much larger effect than any conceivable AGW effect. “ – C.B. Very interesting. I wasn’t aware of that. But I now have to say that makes it even more puzzling (to me at least) why Antarctic ice is increasing (except on the Western shelf which is apparently due to warm currents and submerged volcanic activity). Also, that seems to ‘put the lie to’ the claim that tropical cyclones will become more dangerous with increasing temperature. But that is ” rel=”nofollow”>not what happens in the Southern Hemisphere. And, in a talk by Richard Lindzen, he asserts that, with warming, the equator doesn’t warm much (if at all? ), and the warming gets progressively greater as one goes North (and models cant reproduce that), if I understood him correctly. OK, so if that’s true, then those at the tropics will be relatively unaffected, whereas everyone in the North would benefit – a ‘win win’ situation. Finally, we have the Paleoclimate record to remind us that no matter how high the CO2 was in the past, the global temperature has never gotten higher than 25 DegC (with two possible exceptions). In short, I see no threat, and certainly not one worthy of destroying the economies of the world for, especially since without robust economies the danger posed by even a minor threat is magnified unacceptably. And, “shenanigans” is too mild an adjective to describe what the “realists” have done to the data. The northern hemisphere contains most of the land mass on earth and for this reason only seasonal temperature swings are greater than in the southern hemisphere. About 14,000 years ago the northern hemisphere summer coincided with closest distance to the sun so was 10% ‘hotter’ than today. This dragged us out of the last ice age. The hottest places on earth are desert areas. Oceans have a natural thermostat that keeps surface temperatures below ~ 30C. Latent heat from evaporation cools the surface shifting enormous amounts of heat up into the troposphere where it escapes to space via violent thunderstorms and convection cells. This thermostat will continue for the indefinite future despite any enhanced CO2 greenhouse effect. Basically, the more heat you put into the ocean, the more evaporation cancelling it out? You mean we’ll finally be able to turn off the cli-sci funding spigot (or clamp off the haemorrhage, if you prefer) and redirect our money, effort and attention to, you know, non-imaginary problems? Then the collapse is a moral imperative. As soon as possible. Wouldn’t you agree, Clive? If climate has not “tipped” in over 4 billion years, it’s not going to tip now due to mankind. The planet has a natural thermostat. It makes nil difference whether or not Lindzen himself has successfully isolated and characterised the mechanism of the thermostat. The point is, it exists and it’s as dependable as the sunrise. The climate is not going to tip. Or have I missed some subtlety? was a quote from the Professor. Though, as I suggested, it might as well have come from a junior-school geology teacher. It’d be just as self-evident. Again, unless I’ve missed some subtlety, it seems to me that every able-bodied person in climate science is morally obliged to bring about the collapse of “the whole lot” now, if not sooner. You have it spot on. The argument of Lindzen is convincing. The Earth must have a natural thermostat because otherwise life could never have evolved over the last 4 billion years. Liquid Oceans have existed for well over 3 billion years and are essential for multi-cell life. The Oceans have not boiled away despite a 30% increases in solar output, Meteor strikes, super volcanoes, super novae and (far less important) CO2 levels 10 times greater than today. The oceans must be the Earth’s natural thermostat. You could call it the “anthropic principal”. The climate is stable to external CO2 forcing since otherwise we, the IPCC, and Greenpeace would not even be here to worry and fuss about it. Overall the Earth is immune to whatever minor disturbances humans can produce. I thought the entire climate change subject is about human life as we (humans, plants, & animals) have known it for over 10,000 years (since the end of the last ice age). If it’s about planet Earth remaining a habitable location for at least some of present life forms or new evolved ones, that’s a different issue than what the subject of climate change is about… or have I missed something? I think it would be more accurate to say Human civilisation is threatened by climate change. Hominoids have survived for at least 2.5 million years. Homo Sapiens survived the last ice age. One theory is theory the Younger Dryas shock cooling just before the Holocene forced humans to begin farming to survive which eventually led to cities and civilisation. As Hunter Gathers population would be limited to 1-2 million in total. 0.08 co2 would be the best for plants. More green and more plankton in the seas etc. And maybe we are dodging an upcoming ice age… With more CO2. Pesticides dumping of medicines and hormones in the water. Microplastics which do no go away.. All are much more dangerouss than only the rising of tempersture or the rising of sea level in hundresss of years. The Netherlands most of its land is below sealevel move or build dams. Tidal floods with waves in sync… Yes thats a problem… But can we avoid that ? Or now we have to see if we can blow up the moon ? Put all atomic bombs on one side and try to shift it…?? Or maybe there is another factor and we are just toys in another mans game. Whow knows but i like the science and modeling part. But i am convinced we will only find more questions at the moment for any critisim is highly biasd. And reputstion and thus funding has become the major factor on this subject. I’m not aware of anyone thinking that there is an ideal temperature that we must strive to keep the earth at. Instead, we have the simple fact that we have built a global civilization around the current climate, with cities, ports, transportation infrastructure and much, much more locacted based on the the climate and environment of the last 150 years or so. That doesn’t make the climate of the last 150 years the “right” one, it just means that if we choose to change it (as we are current doing), we will be creating significant costs for ourselves in having to relocate or modify all of that infrastructure. And I would love to hear more about the science behind the anthropic principle. From where I sit, it sounds like you are saying that you’ve embued the Earth will will and a soul, and while you are at it made sure it was a benign one. I don’t believe there is an ideal temperature for the earth either. Humans would probably thrive a bit better in a slightly warmer climate, and we would certainly need less fuel and less food to live in temperate regions. We already de-forested Europe and much of North America before discovering fossil fuels (coal) around 1750. The anthropic principle originated in basic physics and cosmology? The physical constants seem to be incredibly fine tuned in our universe so that atoms are stable, galaxies and stars can form and evolve, chemical elements fused in supernovae. Life needs a previous generation of stars, a planet with a circular orbit at exactly the right distance from a star, liquid water etc. Once life gets started it effects the chemistry of the atmosphere and the geology on the planet. The atmosphere is no longer in chemical equilibrium. CO2 gets pumped out of the atmosphere and oxygen is released. H2O stabilizes temperatures. Finally man comes along and asks how could all this have happened on Earth? Well the anthropic principal says that it happened because we are here to ask the question. There are millions of planets without life. Perhaps there are millions of parallel universes without stars and without life. We can’t be aware of those ones. There have been liquid oceans on earth for at least 3 billion years. The climate is remarkably stable since during that time the sun has brightened by 30%. Whatever we do to CO2 levels the climate overall will remain stable for another billion years, and life will continue. you are essentially saying that your analysis is more trustworthy than the far more voluminous one of, e.g., the core anthropogenic chapter in AR5 written by a strong consortium of content experts: http://www.climatechange2013.org/images/report/WG1AR5_Chapter08_FINAL.pdf. Why should we believe that nearly all leading climate scientists got their analysis ridiculously wrong, and someone – yes, with a Ph.D. in physics but not quite a climate scientist – can successfully out their bluff with a fairly simple blog post? Is it a conspiracy? Are climate scientists an especially inept or ethically-compromised profession? Wow, I’ve never heard of that until they became more insistent with their practically and politically inconvenient reports. Please, lay your accusations out in the open rather than hide behind plots and equations that might or might not be scientifically valid. Or, equivalently, submit your alternative theory to a peer-reviewed scientific journal. 1. I am really puzzled by your decision to correlate temperature with a *doubling* of CO2 rather than with linear increases. Arguably the net increase in the amount of energy trapped in the atmosphere is what matters. So a second doubling of CO2 (which is very much in the books if we continue business as usual) will quadruple the trapped amount. Temperature is proportional to energy, not to log-energy. So why the emphasis on doubling? Because it makes everything seem more benign? 2. The same back-of-the-envelope calculation you make to estimate the effect of doubling, ignores the rather obvious lagging nature of the effect on global temperatures. The Earth’s energy balance with outer space is clearly out of equilibrium as long as CO2 continues to increase so quickly. Fully half of this increase has taken place since 1980. The notion that today’s temperatures already reflect the impact of today’s 400ppm (which is what your calculation assumes) is not serious. I think that will suffice, but strongly doubt you will ever publish this comment anyway. So my main complaint is that we only hear the worst case scenarios of 6C warming by 2100 and never the most likely case which is just <2C warming even under business as usual. One reason for that is the politicalisation of climate sciencce, cheer lead by with various hangers on and green pressure groups. Point 1: The forcing actually does increase logarithmically. Forcing absorbed over time is energy. So one expects temperature to also increase logarithmically. Feedbacks may modify this especially water vapour and clouds. Water vapour increases with higher temperatures but so do clouds. Water vapour feedback is very likely positive but clouds may well be negative. Point 2: The modern term for this is the difference between "Transient Climate Response" and "Equilibrium Climate Response". TCR is what you expect by say 2100 and ECS is what happens 100s of years later from the same increase in CO2 - mainly due to heat "inetria" of the oceans. I looked at this in http://clivebest.com/blog/?p=4923 ECS is higher, but I was referring to TCR in the above article since this is what our ancesters will “perceive” as global warming in 2100. Wrong. ECS is notional, useful as a model benchmark but something that *can’t ever be reached* or even approximated due to the operation of slow feedbacks (some of which, note, are kicking in already). Earth System Sensitivity (ESS) is more like what you describe, although strictly speaking it can’t happen either since it requires stable CO2 over an extended period. But unlike ECS it can come close enough to happening to make for informative comparisons between an increasingly high-CO2 future and past high-CO2 periods. The usual reference point for this discussion is the mid-Piacenzian (of the Pliocene) about 3.3 mya. Extensive results show that with CO2 levels approximately equal to present, GAT was at least 2C greater than present, ice sheets were greatly reduced with considerably higher SLR (regarding which there was a pretty crude attempt in the AR5 to paper over the difference between ice sheet models and paleo results), and, notably, there was a complex magafauna community on Ellsemere Island featuring e.g. camels and beavers. We have an awful lot of infrastructure occupying areas slated for inundation, including the bulk of our major cities. Large portions of the tropics will become functionally uninhabitable (perhaps not literally so, but to the point where it becomes impossible to work outside for a larger portion of the day). The range of tropical diseases will extend far into the northern land masses. Dry will get dryer, wet will get wetter, making agriculture harder. Temperate-zone mountains will lose most of their glacier and snow cover, further impacting major crop-producing areas. And don’t forget ocean acidification, which is a function of the rate of CO2 rise and so is not associated with past warm climate states. So the big question is how fast the transition will be since that will be a pretty good measure of how bad it will be. Present slow feedback response (of ice sheets and permafrost, e.g. ), which note is occurring far more rapidly than predicted, implies that it will be relatively fast. Thanks for your comments. You are right that ECS is a theoretical construct because CO2 is never held constant indefinitely for climate to stabilize. Also I really ought to update this article as it was written 2 years ago. Your reference to a period with similar CO2 levels the mid-Piacenzian (of the Pliocene) about 3.3 mya is interesting. That was at the beginning of the cycle of glaciations during the slow cooling period from about 5.3 million years ago. Is it really known what caused that cooling ? I have read that there are a number of proposals based around plate tectonics and the positioning of Antarctica over the South Pole. What is also interesting is why natural CO2 levels then were higher (400ppm) than natural values (280ppm) today. This clearly must be related to surface temperature but whether CO2 is the cause of the (natural) surface temperature or the effect ( optimum atmospheric radiation + ocean outgassing) is not clear, at least to me. Either way I agree that anthropogenic forcing an increase in CO2 to 400ppm and higher must lead to warming. If somehow CO2 stopped increasing now then after a few thousand years levels would return to their current natural level of 280ppm at least until the next glaciation begins. In the mean time we are in a bit of a pickle regarding civilization and human population. Changes will happen slowly, so there will still be time to adapt, but I agree we need to reduce emissions fast. I can see no other alternative than a rapid increase in nuclear power generation of electricity and electrification of transport and heating. Clive, thank you again for this blog. It is really informative and tries to retain balance and objectivity. It is pleasing to read something that is not a two way mud slinging exercise. If you have two adjacent chambers of gas separated by a door and one contains air at 0c the other air at 100c. When that door opens we almost instantaneously get a 50c mixture. Is this a mixture of molecules at 100c and 0c, of does energy quickly pass between molecules so that they all have a temperature of around 50c? Next if one chamber has cold air and other hot CO2, on mixing does the energy from the CO2 transfer to the air on mixing, or do we have a mixture of hot CO2 and cold air? This is important because if energy rapidly transfers between vibrating molecules, then concentrating on radiation effects ignores other routes of energy transfer. I have experienced warm most winds and so could accept that the greenhouse gas water is the heat carrier, but with a warm dry wind, I doubt that there is enough greenhouse gasses to carry the heat. Do N2 and O2 carry heat, or at least what feels like heat to me? I keep encountering graphs of climate change often 1880 to around 2000 or so which show average global temperature with a five year running average that looks like an upward moving worm against a background of annual figures. When look at this graph however it looks more as if there has been three extended periods of stable temperatures linked by a couple of rapid upward jumps in temperature. Is it possible that these jumps have caused by the way we measure and record temperature. Certainly, across the twentieth century there must have been improvement in the number of weather stations and techniques for measuring. If measurements are corrected to Victorian standards, do we still see the same change in global temperature? In concentrating solely in greenhouse gases do we risk ignoring other factors that could contribute to heating, e.g. I have millions more questions, but enough for now. The answer to your question about the accuracy of temp recordings is being addressed currently by a program to adjust out deduced errors in local temp recording. The adjustment is small and it does not always go in the warmer’s favor, although they are in charge. The record obviously gets more uncertain the further back to 1850 you travel but the record for the last 60 years I feel is solid. I asked your a question along the lines of your first question here about a month ago and since have found that some models do account for CO2 acting as a heater of the tropopause when getting direct sunlight, especially in the tropics. The effect is combined in a term Effective Radiative Forcing (ERF) which varies in different climate models and in very complicated ways. They have become so complicated in fact that according to one top model researcher, they are now nearly as hard to diagnose as the actual atmosphere. Thus for the past 10 years dozens of papers have been coming out making claims about the atmosphere from the models, ignoring the fact that no model has shown predictive value in any time interval since they began making them 40 years ago, no matter how often they are tweaked or redone. Clive, do you know why the ERF is still assumed to be so high in the models, (2-5 Cover next 90 years) when it is no longer assumed that feedback from water vapor is positive? The models now assume climate resistance, the drag on rate of climb is shared about equally by cloud feedback and ocean uptake, the former being strictly temperature dependent and the later based on delta from equilibrium sea temperature, which drifts over decades with currents and layer dissipating effects. With feedbacks being negative, and your assumption that forcing of CO2 alone is only 1 C per century, is there a theoretical basis that you know of for making CO2 forcing result in a delta of 4-5 C ? It’s not clear to me whather this is independent of feedbacks or actually are feedbacks. Normally feedbacks are defined as a response to temperature change while these seem to be ‘independent of temperature’. All this sounds a little suspicous to me. I will try and find out more. Thank you for such a full reply. I have only discovered it today. Over the past month I read a great deal, going right back to basic physics, since so much of what I read seems built on premises that may not withstand scrutiny. What started as a simple questioning has taken me into a can of worms in which I may end up wriggling for some years yet. A mathematician friend recently told me that even three variables may never be fully resolved. This suggests that climate modeling may always be intelligent guess work. I’m told that with weather forecasting that if you predict that the weather tomorrow will be the same as today then on average you will do better than the forecasters with supercomputers! Two gases at different temperaures will mix together extremely fast sharing the kinetic energy between them to reach a new thermal equilibrium. Molecules at room temperaure are moving at an avergare speed of 500 m/s so they are colliding and sharing energy with their neighbours very quickly. However the atmosphere is different. It is NOT in thermal equilibrium. In fact heat is continuously moving up through the atmosphere from the surface. The density of air also falls with height due to gravity. There are 3 ways heat can move upwards. – Convection (hot air rises), Latent Heat of evaporation from oceans, Radiation. Radiation is the only way heat can escape to space and this depends on wavelength. Some can escape directly from the surface while the rest gets absorbed and re-radiated by green house gases – mainly H2O and CO2. The thermodynamics of the atmosphere keeps the lapse rate (decrease in temp with height) close to the (moist) adiabatic lapse rate. In the morning the land heats up steepening the lapse rate – hot air rises to bring it back to the adiabatic rate. Thunderstorms result in the tropics when moist air rises rapidly and condenses fast in the aftrenoons. All that happens if CO2 increses is that the height where 15 micron photons escape to space increases in height where it is slightly cooler. As a result a little less radiation escapes to space. This is because at any height the ‘black body’ radiation for a given wavelength depends on temperature through Planck’s law. Of course the rest of the climate responds to this small change. This is where all the uncertainty is. Perhaps more clouds simply counteract the change. Time will tell. Thanks for this very full answer Clive. Sorry not to reply immediately, I only found the reply today. It does seem that modeling is proceeding before there is enough measurement and understanding a is intelligent conjecture rather than sound science. Now that my reading is more advanced I am going to start collecting all the seminal papers relevant to each aspect of the system physics to see what is sound science and holes need filling. Having attempted many years ago to model some simple biology, I suspect that there are too many variables to ever create a fully reliable model. At least much more is being measured measured more reliably, so in the future there will be good data. I must say that each time I read Clive’s work and the comments that follow I become a bit depressed thinking that there is no serious climate discussion going on at the national level that the general public can readily see or understand. Our politicians appear to be enthralled with the self appointed Climate Scientists and this group seems to be made up of meteorologists and mathematicians who enjoy the influence they have at the highest levels of government while not having to subject themselves to a rigorous scientific debate. We need to find a means to raise the scientific debate to a broader audience. Is there anything like that going on of which I am not aware? Jerry, don’t forget: the very fact that there *is* a scientific debate means that one of the two sides has been sedulously lying to the average punter for the last 20 years. Which ought to be enough to raise the question, at least in the minds of anyone who isn’t invested in his or her own deception: why would they want to conceal the existence of disagreement? Are they lying or just spouting what they believe is the result of scientific study. You would think that the varying results the models are turning out should cause a vigorous debate over which, if any, are right. Instead they seem content to use an average to justify a possible worst case scenario. It seems to me that simply averaging the multiple simulation results is less than scientific and their should be some voice of sanity raised to try and force these Climate “Scientists” to survive some rigorous discourse. I do not see that happen anywhere other than in small niches such as the one Clive as put together to try and bring some rigor to this effort. Unfortunately it still does not seem to have the broader voice that it needs, yet. The distinguishing feature of the PID controller is the ability to use the three control terms of proportional, integral and derivative influence on the controller output to apply accurate and optimal control. A second order differential equation with PID(Proportional, Integral and Differential) control. 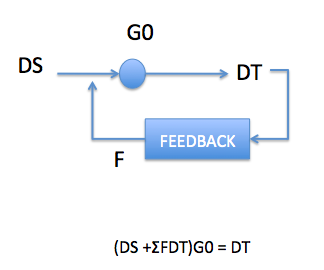 Note: This is not the deterministic feedback loop beloved of atmospheric physicists. Differential control deals with fast transients and is of little interest. Proportional control is the basic element that provides an immediate restoring force both ways but it cannot provide long-term precision of response; that would be the claimed AGW response of more CO2, higher temperatures. What is missing from the AGW claim is the integral response that steadily reduces the error from the set point, whatever the forcings. On a daily basis, this SST control loop operates on the integral element alone. The integral response would be the number of operating TSs at any one time. The diurnal variation of SST provides the TS starting procedure. The diurnal SST variation is coolest at dawn and warms during the day. If the SST rises sufficiently, TSs start and cool the water below them. It is an important point to note that the TCs keep operating when the SST below them drops clearly below the initiation temperature; it takes the setting sun to stop them. This process holds the ITCZ SST at temperatures slightly above or below the control loop set point. Knowing this, it seems to me that the AGW paradigm contains a serious flaw..